It's that time of year again when we're all stocking up on knitwear. Even though it's officially Autumn (yay for pretty backdrops!) It truly feels like Winter... It's dark when I set off to work, and dark when i'm coming home. Cars need scraping in the morning, that extra pair of socks is well and truly needed, and long gone are the weekends where you can leave the house on a night out without a jacket. But on a slightly happier note, it's the time when we invest in gorgeous faux fur coats, cute bobble hats, sluggly onesies and thick jumpers. Not to mention it's Christmas soon!! 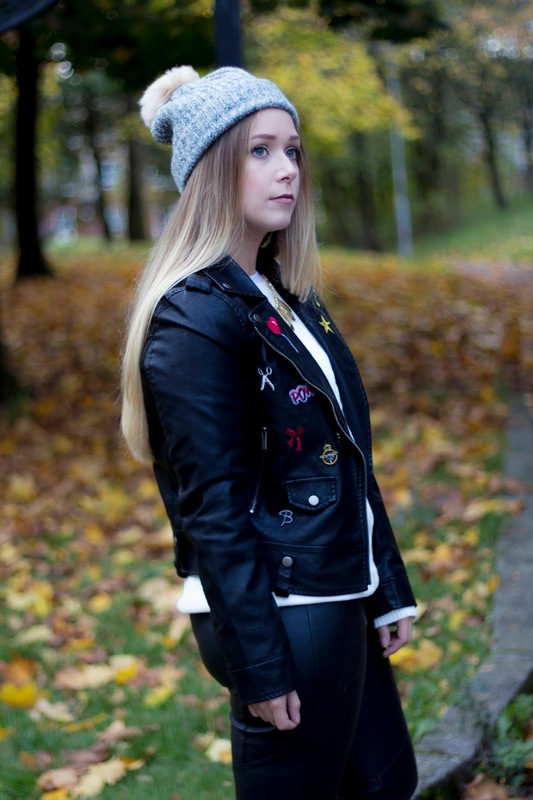 So as i'm sat here absolutely freezing, I thought it would be the perfect time to talk about staying warm wearing my new cute Autumn goodies from Sugarhill Boutique! Every year I find myself loving Sugarhill Boutique's jumpers more and more... Infact, i'm currently wearing one of last year's animal jumpers and I still love it to death to this day! (FYI you need to take a look at this year's animal jumpers!) The newest additions to my wardrobe from their cosy knitwear collection are this gorgeous white cable knit jumper, and faux fur pom-pom bobble hat. I absolutely love this thick knit, infact white jumpers are my go-to 90% of the time because they literally go with anything! This particular sweater has knitted grey hearts on the elbows, which adds a super cute girly feel to my outfit! I also love how it looks with my grey kntted bobble hat, which again is super cute and accessory that will go with almost every jumper in my wardrobe! A warm sweater with a bobble hat and ankle boots will definitely be my go-to for everyday wear this season. Just add a statement coat and you're ready to brave the cold! The perfect outfit for a cold, winter day!